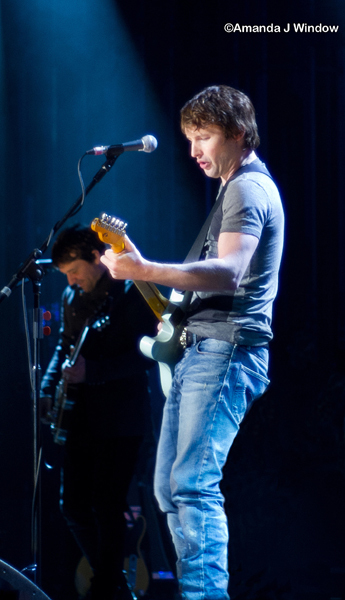 James Blunt has gone from being an officer in the Life Guards to being one of the world’s most successful singer-songwriters. On Wednesday night, Blunts devotees gathered at the Manchester’s O2 Apollo eagerly awaiting his performance. Not the place I would have expected for such a high profile star, with its sticky carpets and retro décor. But Blunt, casually dressed in a t-shirt and jeans, looked relaxed as walked down the central aisle through the theatre shaking hands with his fans before taking to the stage. Blunt expressed his fondness of Manchester and launched into an old favourite ‘So Far Gone’ followed by ‘Dangerous’. As he strummed the first chords of ‘Carry You Home’ you could feel the crowd’s anticipation before they themselves broke into song. As usual, Blunt’s performance was spectacular, his voice retaining each crystal clear note, each song having it’s own intimate and poignant story written into the lyrics. Blunt apologised to the audience for some of his songs being miserable. In these tracks you can certainly feel his personal pain of lost love and regret. And you can clearly feel the rush of emotions as he reminisces of tear jerking affairs of the heart, whilst the ladies in the room shed tears simultaneously. Blunt certainly delivered what the audience was expecting and wooed the fans, ladies and gents alike, although from my vantage point the audience seemed predominately female. During the hour and a half long performance, Blunt took us through tracks from both his earlier albums and tracks from his new album ‘Some Kind of Trouble’, ‘You’re Beautiful’ raising the biggest round of applause. Blunt encouraged the audience to stand up for some of his more upbeat songs and then he apologised again to his fans, that they hadn’t heard any his new material until now. At one point he left the stage, for a little ‘run-around’ to mingle with the audience, before taking to the stage again to complete his performance. No concert is complete with out an encore where Blunt delivered an old favourite ‘1973’. As proceedings came to a close Blunt, with his boyish charm, produced an instant camera and took a photo of his adorning fans. In a recent interview at the Brit Awards, Blunt said that he ‘Loves being on tour and travelling around the world’, and that ‘He thinks he is so lucky’. Blunt will continue touring the UK before heading to Europe, then across the Atlantic to start the American leg of the tour in mid April. And it wasn’t long before Blunt became an overnight success. ‘You’re Beautiful’ entered the UK charts at number twelve, and quickly made it’s way to the number one position in just six weeks. Blunt's second album, ‘All the Lost Souls’ sold 65,000 copies in its first week. Judging by Blunts, thirteen month, tours sell out status, it shows no restraint to Blunt’s continued success and it’s clear to see what talent, that man, clearly has. Supporting James Blunt at the Apollo were Wakey Wakey from Brooklyn, New York.